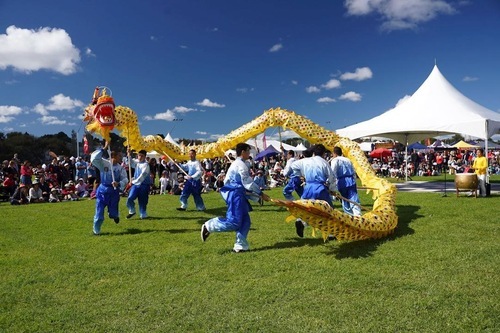 Falun Gong practitioners in New Zealand joined the 20th International Cultural Festival in Auckland on April 7, along with delegates from 56 nations. In her opening remarks, Prime Minister Jacinda Ardern welcomed Auckland’s mayor and council members, as well as MPs of various political parties. This was followed by the Falun Gong exercise demonstration on stage. The Falun Gong exercise demonstration, as well as the group’s waist drum and dragon dance performances, were well-received by the audience. 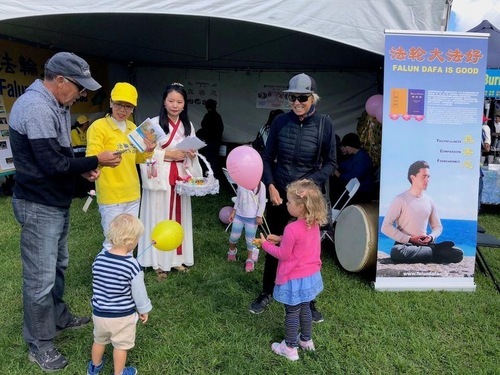 Jade Davis, a government officer responsible for community programs, said he was impressed by the peaceful energy field of the Falun Gong exercises. He said he had recently been looking for a meditation practice to help him achieve a calm mind. He also expressed concern over the suppression in China and said he would share the information on social media. Practitioners introducing Falun Dafa at the 20th International Cultural Festival in Auckland on April 7, 2019. As one practitioner explained to her the meaning of these three characters, she wrote it down on a notebook. “These [principles] are important for us and our society,” she said. An engineer named Muhammad stopped to watch the group’s waist drum performance. He had heard about Falun Gong and the persecution, but he was still surprised by the severity of the persecution. “I know the Communist Party tends to control people’s minds and it has been doing so for a long time. But freedom of belief is a basic human right and the brutality must stop,” he said.